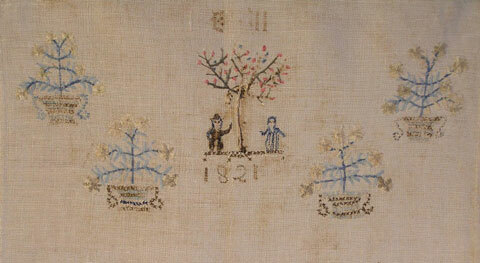 In Pennsylvania German culture, the decorated towel was used strictly as an ornament or embellishment on a door. 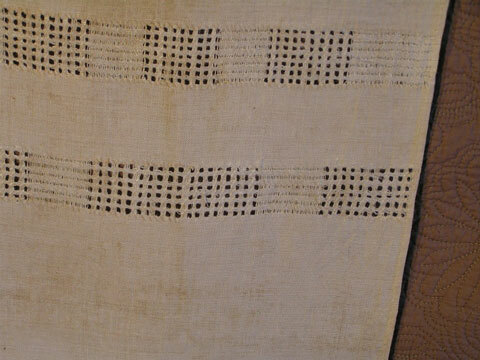 It is said, by some, that it was used to hide the dirty “everyday” plain towel when company came, although it was more likely used as a way to display one's needle work prowess. 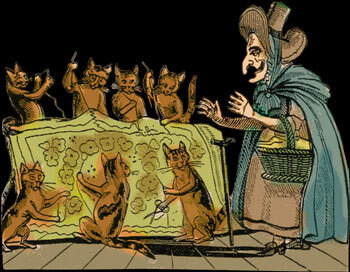 They were made out of natural homespun, hand-woven linen and decorated in all manner of motifs usually taken from the young ladies' practice samplers: birds, flowers, the alphabet. It is the rare few that actually have people in the decoration. In addition to counted cross stitch embroidery some were embellished with drawn work panels with needle weaving or worked in a darning stitch. Needless to say, no two are alike. 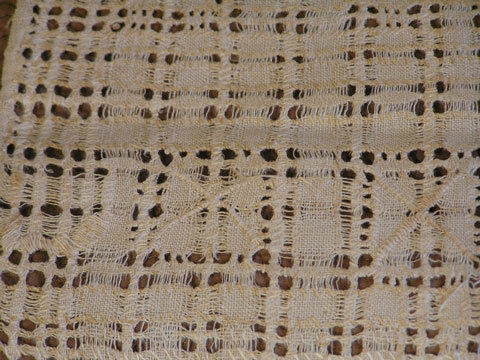 Several things about this particular decorated towel make it extremely unusual and rare. First and most obvious is the presence of the two stylized figures (worked in silk thread) in the top center of the piece, standing on either side of an apple tree about which is wrapped a serpent. 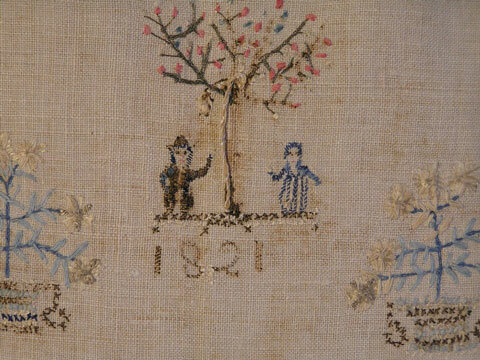 The second thing that stands out is that it is stitched free-hand style and not in the traditional counted cross stitch used in the early pieces. Some towels of much later origin, say, 1880's or so were done in this fashion, but few with so early a date as the year signed on this one : 1821. All of this is worked on balanced plain homespun homewoven linen with drawn work throughout the towel embellished with needle weaving. There are the initials “EH” at the top center of the towel. It measures 44 inches in length including the hand-knotted fringe and 11 inches wide and is hemmed on both vertical sides. 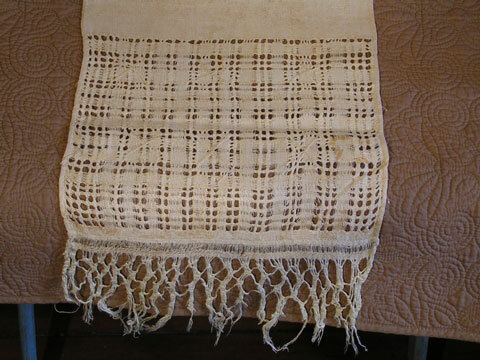 It is in excellent condition with only the knotted fringe showing signs of some loss. The body of the linen has taken on a nice warm patina that homespun linen shows attendant with this type of age. It was found in Montgomery County, PA at a farm sale years ago. This piece has been in my collection for a while. It's a rare and wonderful find, and is a “must have” for the serious collector of Pennsylvania German homespun culture.